Hard to believe but it is that time of the year again. Christmas and New Year is upon us and this is the last issue of the digest for 2015, which in truth has been a hard year for me personally for a number of reasons which I won't go into here - but suffice it is to say, I hear many of you have also had a difficult time of it so the sooner we see the backside the better! So with this in mind, let us finish the year on a high note - so grab a nice warm glass of eggnog or your beverage of choice and settle in for an appropriately themed issue of the digest! Another busy month on all fronts leading up to the silly season - we had quite a few things that did not quite stay on schedule as I had hoped (for example - some staff got sick, a web designer moved house and lost 2 weeks of work and I was working like mad just trying to keep the wheels turning) but at least early on in the month I finally got around to adding 2 new rather lengthy detailed reviews to the main site, one the RK Euro line triple sword review and the other the high end Kesshi Katana by the Imperial Forge..
A third review is currently in the works (currently half finished, writing the digest put it on the backburner) - so like last month, the YouTube video provides a bit of a sneak preview.. 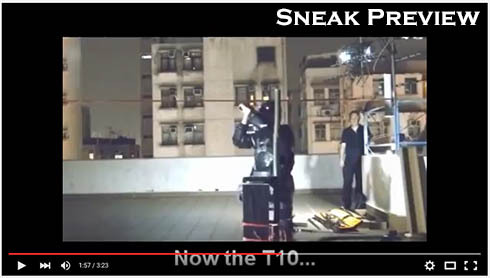 Unlike the other two reviews, the video is just the tip of the iceberg for this one - and because of all the behind the scenes coordination required for this project is rather time intensive (it really is quite a revolutionary line) - I will talk a little more about this one right at the end of the issue (let's just say that lovers of affordable katana are in for quite a treat!). Speaking of YouTube, we have released a steady number of new videos since October, including one just for fun - which is a compilation of SLOs doing what SLOs do (i.e. breaking) which kind of went viral on Facebook but was pretty static on YouTube..
Quite amazing the comparison actually - on YouTube it has a rather modest 1,214 views - on Facebook the exact same video reached 354,000 people and had almost as many SHARES as YouTube got views, so no wonder YouTube complains that Facebook is "stealing" its video traffic..! Who knows how this stuff actually really works, another video I added just to Facebook that I personally thought was quite hilarious entitled "Possibly the Worst Sword Movie Fight Scene Ever" got very little interest, if you have a bit of an oddball sense of humor like me and want to check it out please visit our Facebook page and be sure to like our page if you haven't already.. Truth be told I am only now really starting to figure out how all this social media stuff works and could do with some encouragement and people spreading the word and telling us what they would like to see there..
We are still working on several other major projects that are behind schedule for one reason or another, such as the new look site, some upgrades and changes to the SBG forum and many other related smaller projects - so be sure to visit us over the coming couple of months. As always, I will be taking a break from writing the digest for January, so to stay up to date be sure to check our Blog regularly..
With all the emphasis on social media like Facebook, twitter, etc you may have missed an old favorite of mine, blogs.. SBG has had several blogs over the years, indeed the current SBG Store Blog is a consolidated version of two blogs and has posts going back to 2009 in the archives and will be getting some additional TLC over the holiday season, but here are some you may not know about. Most recently our friends at Ronin Katana have been actively blogging again with their Samurai Sword Blog which offers rare behind the scene information on modern day sword making practices, informative posts about Samurai sword culture and even discusses the latest TV shows and movies to feature swords in them. Written by owner of Ronin Katana Chris Scoggin and with guests posts by long term SBG contributor Dan Dacombe, it is both informative and entertaining and really does provide an insiders view of the industry that few people ever get to see..
Another cool blog you may want to check out is the Art of Swords Blog which features a frequently updated collection of stunning antique sword pictures and while ostensibly has been running since 2012 has only recently come back to life. Check out the archives here for hundreds of pictures of stunning swords from all eras and cultures taken from a variety of sources..
And finally, a requiem of sorts - last month some lovely hacker decided to take advantage of some security loopholes in Sword Manufacturers Guide.com while it was between software updates and delivered the much neglected and beleaguered site its final death blow.. In some ways it was a blessing in disguise as it never did get the attention it deserved, SBG is more than enough of a workload by itself - but in other ways it is disappointing that someone would go out of their way to target it like this..
Luckily the manufacturer dossiers that formed the core of the site had already been transferred to SBG, but always sad to see a labor of love destroyed by someone who has nothing better to do. 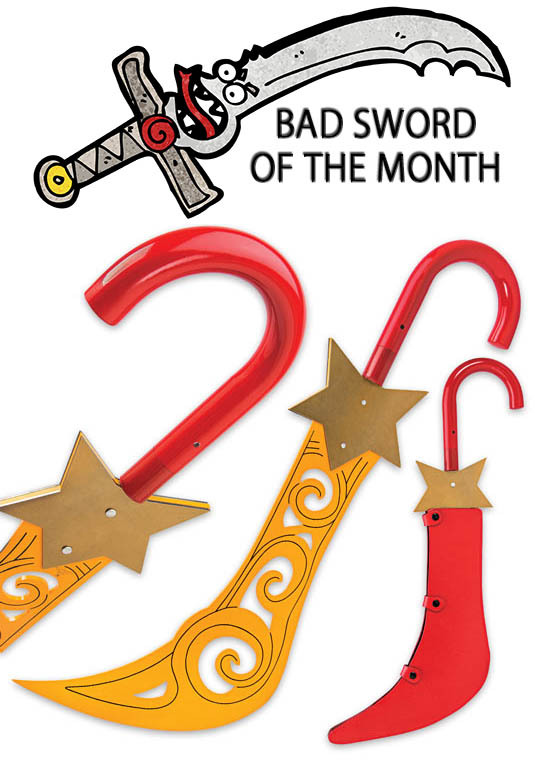 You might think I am always picking on Anime or Video game SLOs when it comes to selecting the Bad Sword of the Month.. But this time, try as I might, I just could not pass up having a jab at this one.. Apparently it is based on a video game "League of Legends" - but seriously - it looks like Santas’ candy cane sword gone horribly wrong to me.. 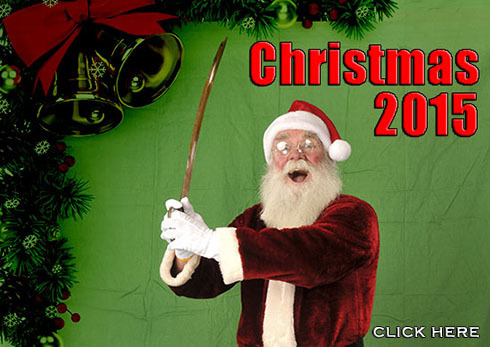 Personally I prefer their 75" white demon can chop wood KNIGHT ASSASIN Chivalry Bushido Keyword Sword Blade Katana Warrior Samurai Fighter Short Long Sword Blade Warrior Katana - just $0.02 with $399 free shipping and plus one to damage.. (rolls eyes)..
Rather than a Santa hat this Christmas, why not try something more "swordy".. 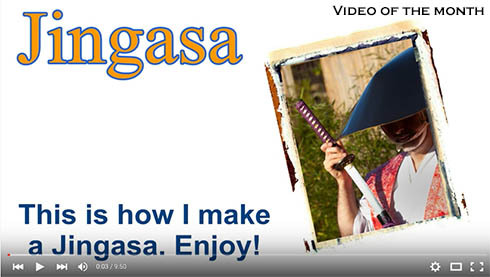 Here is a cool instructional video made by one of our customers in the Netherlands showing how you can make your own Samurai Jingasa war hat just like in the classic Samurai movies. It's cheap, easy to make and looks cool and a great fun project for the holiday season..! We do our best to ensure extraordinary quality with the SBG custom katana line. But sometimes, things don't go to plan. It is what happens next that I think makes the difference.. Long thread with some real behind the scenes insights on this line and the ebay competition..
Fable Blades latest direction away from custom orders and towards what Brenno wants to make himself with two stunning Conan/Hyborian inspired swords. How much is too much when it comes to flex testing a sword? What should you expect? What does flex testing actually prove and why is it done? All these questions and more answered in this informative thread. SBG Forum - What's going on with Gus Trim? The title says it all - the thread shows some are still available here and there, but the days of $400-600 Atrims seem long gone..
Long time subscribers will know that each Christmas we traditionally put out a brief guide to how to survive and get the most out of the silly season. This month, we decided to reach a wider audience and made the Christmas guide available right here on the main site - including tips for people buying swords as gifts, how to ensure you get the right sword for the right person and avoid the top mistakes people typically make at this time of year.. This coupon code (enter as written, Capital "C" with a space between 2015, or just click the coupon to add to your cart) applies to each and every item in the store except for our already heavily discounted items in the Hot Specials section. And with so many items currently in stock, especially considering just a few days ago two full container loads arrived from Hanwei, the number of swords and items you can save on is a sword shoppers delight! Right now there really is something for everyone - and I was especially pleased to see some new offerings from Hanwei this years end, such as their futuristic interpretation of a Kukri - just $229.99, or 206.99 with the 10% discount. Or the return of one of my favorite one handed cutters of all time, the simple yet amazingly effective Practical Gongfu Broadsword which has been out of stock for so long it seemed it had been discontinued.. A true bargain at $189.99 but even better at $170.99 with the 10% discount code..! See what else has made a comeback in the Hanwei section of the store HERE And if that wasn't enough, in preparation for the Chinese New Year shutdown in February next year we are currently offering both previously archived Forge Direct swords with a built in 10% discount, PLUS you can use the coupon code to save an additional 10% until the 5th of December..! True enough, they won't be ready in time for Christmas (most will arrive in the first or second week of January) but considering the savings add up to hundreds of dollars per sword and includes models that will not be available again anytime soon, now really is the best chance to pre-order one of these heirloom quality master smith forged blades at a ridiculously low price..
We couldn't quite make it in time for this issue of the digest, but if everything goes to plan there will be a new affordable Katana line launch happening in the first week of December that has been many months in the making..
As you have seen from the video these swords perform quite well, but this is just the tip of the iceberg..
To give you some extra clues on what to expect - they are very reasonably priced (sub $300), the concept comes from one of the co-founders of Musashi Swords who I met in Hong Kong after the tests, there will be an introductory special limited release and they are semi-custom without the need to pre-order or wait months for..! The details and full review will all be completed over the course of the next few days, and when it is we will be announcing it via Facebook, our blogs and most detailed of all - the SBG sword store newsletter - so if you are not a subscriber, well, you will want to be..! Click here to subscribe and get the introductory pricing! Well, that is it for the Christmas edition of the digest. Hope your holiday season is a good one - next year will be a big one for SBG, but there will not be another issue of the digest until February (at which time the new format should finally be completed) and no doubt there will be a ton of new announcements and news, so until then, happy swordening, Merry Christmas and a happy new year to you all.